I do not know what Pakoras are known in English, as there is no word for it being a typical snack of Pakistan. Its usage increases in the month of fasting in as every fasting individual likes a rather chilly thing to eat at the end of the long day. 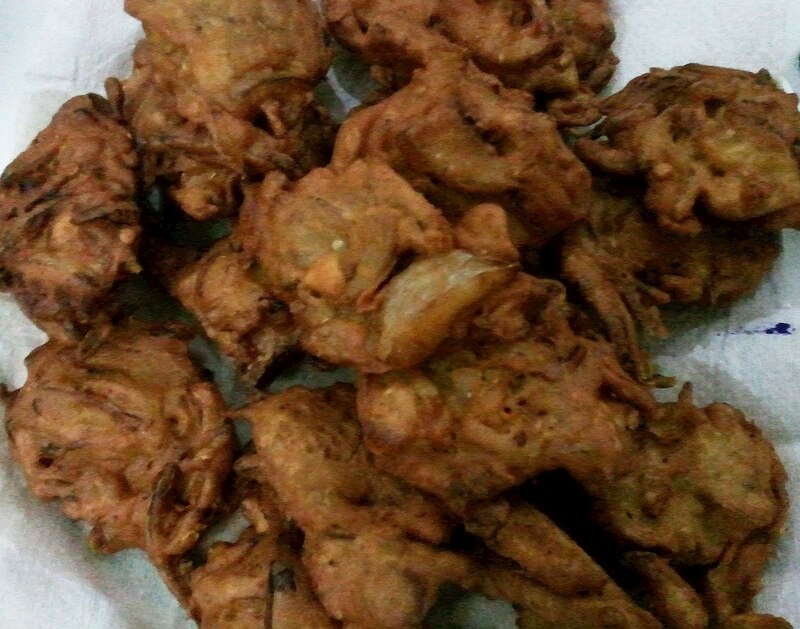 Those who can “tolerate” the red chilies, and a rather burning sensation, Pakoras are for them. If you haven’t tasted, do give it a try, you will certainly like it – of course yelling for water at the same time too. 250 grams Gram Pulse (Daal Channa) powder (we call basin) - I may clarify it here that in some recipes, "basin" is translated as Chickpea Powder, which is incorrect as chickpea and Dal Channa are two different lintels and "basin" is always made from Dal Channa. Tip: The teaspoon quantities are approximate; these may be varied to one’s taste. For starters, these may be considerably reduced. Chop the onions and the fresh green chilies into thin slices and put these in a mixing bowl. Add Dal Channa powder (Basin), salt, red chilies, coriander powder and baking soda and mix it well. Cover it and leave for 1-2 hours so that onions drip out their water which will add to the mixture naturally. Add a little water and make a thick paste of the mixture. Put oil in a heavy bottomed frying pan and let it heat up. When the oil is adequately heated, with the help of table spoon, put clusters of mixture into the heated oil. Fry these till almost golden brown from both sides. Take these out in a flat bedded plate with an absorbent paper on it, so that the extra oil on freshly fried Pakoras is absorbed. Now Pakoras are ready – eat immediately, lest these cool down and become soggy, with tomato ketchup – best would be chilly garlic sauce to add to the taste. But remember; eat these at your own risk as chillies and chilly garlic sauce will make it too hot for you if you are no accustomed to eating hot stuff.